is an app that you can install on multiple computers and mobile devices that synchronizes everything you store in it, across all of those devices and online. This allows you to have every file you need available at your fingertips at anytime. is now a crucial part of my workflow and highly recommend this app to anyone that needs quick access to files anytime/anywhere. Interesting story about people helping robots traverse Washington Square Park in NY. 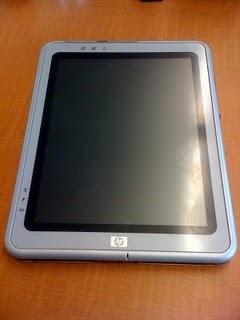 tablet PCs for faculty to use in the classroom. Eventually our campus added tablet PCs to the computer replacement program so as faculty replaced these machines they found their way back into our office. They were still usable machines so we decided to try loading linux on them to see if we could breathe some life back into them. A few people tested them out but they were never really used much and just started gathering dust.
. My plan is to use Evernote at meetings and sync using wifi so all the notes will be on my main machine right away. I did all this over our break week. I haven't had any meeting yet since this is the first week of the quarter, but plan to document how this all works once I have my first meeting of Spring quarter. I read an interesting article today about "How to Present While People are Twittering". It is a great illustration of how to use this technology to engage your audience. I might have to try some new techniques in my next presentation.